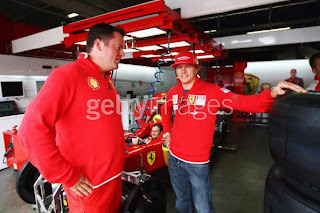 Kimi Raikkonen believes he can score a podium for Ferrari in the European Grand Prix at Valencia this weekend. Speaking to the press after ending Friday's free practice the 2007 World Champion said that he was happy with the car and the progress he had made during the two 90-minute sessions. AUTOSPORT was there to hear what he had to say. Q. What was the most challenging thing today? Kimi Raikkonen: It was a normal Friday. We tried to work with the car. In first practice it was quite tricky but in the second it seemed to be working pretty well. It was very normal with no problems. Q. Do you believe that a podium finish is a realistic target? KR: Yes. We need to get everything right and it depends on what happens in qualifying and at the start of the race. But I am happy with the car and that's a good start for the weekend. Q. Where can the car be improved? KR: We need more speed. But overall the handling is pretty good and if we had more downforce we could go quicker through the corners. But apart from that, the balance is not too bad. Q. Did you help Luca Badoer today? KR: I was busy with my own things, but we will talk later if he needs to. He has enough help if he needs it. Q. After your rally outing, how do you feel about rallying as a future? KR: I will do some when I have time and when I have found some good rallies to do but right now we are focusing on here and we will see where there is a big gap in the racing. Q. What did you do during the break? KR: I had a rally and then a normal holiday at home. Q. You knew that Michael could be racing alongside you by newspaper - is that right? KR: Someone told me when I was on the rally that he will probably drive. For me, it was no problem if I read it in a newspaper or the team tells me. There was nothing to tell anyway because it was not 100% sure. Q. One rival team boss has talked about expecting to see Fernando Alonso here next year. Has your position changed for next year? KR: It's always the same question and the same answer. I have a contract and that's the situation right now. That's all that I know.